Graffiti has become so common within the city of Moose Jaw that it is practically a part of the landscape. Designs great and small litter homes and storefronts but it is hard to know how to get rid of them. More than washing chalk drawings off of concrete surfaces, spray paints soak in and stay put. A proper Moose Jaw graffiti removal service digs deep to remove stains and discolourations left behind by paint. The term “street artist” is just a polite way to say graffiti vandal. No matter how you label them, these painters are competitive, quick and persistent. Just one small splash of paint can lead to many in no time at all. Because street artists are competitive, signature styles or tags act as a way to mark territory. If you don’t remove graffiti quickly, it starts to pile up. One tag leads to two and before you know it, you are drowning in paint! While tags are the most common form of graffiti, there are always others to watch out for. Offensive symbols or words are a common occurrence in the wide world of graffiti. Having these unwanted designs splashed across your property can send the wrong impression and drive away business. Don’t let these items sit any longer than they have to, when you can call a Gorilla instead! When thinking about graffiti removal products, pressure washers are the first thing to come to mind. It seems easy enough to blast away unwanted paint, but that is easier said than done. In order to properly tackle painted surfaces, you need to understand how this medium works. While some paints offer control through brushes, aerosol cans offer little precision. In addition to the main design, graffiti features overspray and even bleeding. 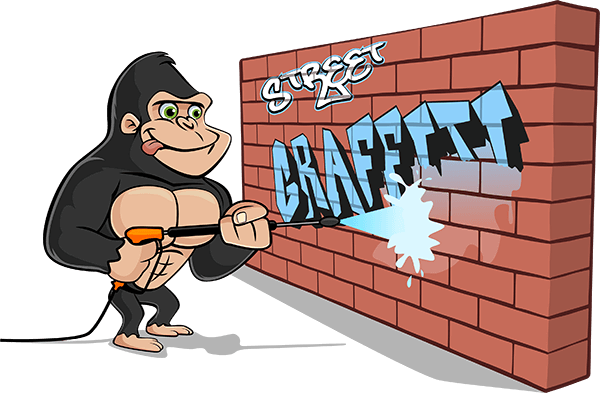 One of the best removal tips offered up by our Gorillas is to treat each aspect of graffiti in its own way. Focusing on one area of the stain does not do much to remove shadowing, bleeding or overspray. When you choose a professional paint remover, you can expect each of these areas to be treated properly. Simply pressure washing an area is not enough to get rid of spray paint. In order to get rid of graffiti, our Gorillas work in steps. It has taken years to develop the shining reputation that Gorilla Property Services has. Expert customer services sets our specialists apart but we also do not take “no” for an answer. Just because paint is problematic, does not mean that we will accept average results for your removal. By treating stains at the surface level before digging deep, there is no staining left behind! Older paint jobs can soak into the façades of properties, making them difficult to remove. In cases where our eco-friendly Gorilla Foam, brushes and pressure washers don’t work, there is always paint! Our Gorillas are prepared to match paint colours to your property in order to create a seamless cover-up for your home or workspace.